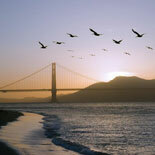 Sweet Summertime in San Francisco is made sweeter with a California Sunset Tour! This professionally-guided Bike ride takes you across the Golden Gate Bridge at sunset. Experience amazing Views, Flat Paths, Family Fun while taking pictures like a pro. 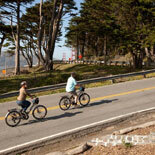 Enjoy biking on the California Sunset Tour, from the Golden Gate Bridge to the Presidio! See the city at it's best light at sunset. 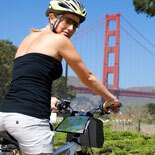 Get intimate with San Francisco on this guided bike tour of the City, Golden Gate Bridge and surrounding areas. This exclusive ride takes you coastal along the famous San Francisco Piers, through Crissy Field, past Fort Point and across the breathtaking Golden Gate Bridge. Cycle on the West/Ocean side of the bridge, which opens at 3:00 pm strictly for cyclists. As you cross the Golden Gate Bridge, a friendly and knowledgeable tour guide shares the incredible history of the Bridge: Its conception, creation and its place as one of the most recognized landmarks in the world. 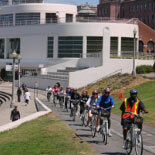 Ride the "road less traveled" past San Francisco's famous and breathtaking monuments and historic graveyards. The California Sunset tour provides guests with a fun and memorable experience without exception, without fail, every time. The equipment is "guaranteed fresh". The dedication to the quality of bikes, service , friendly and knowledgeable staff guarantees the bikes are comfortable, reliable and safe. The California Sunset Tour has quickly become a must-do activity among visitors. The facts and stories are invaluable pieces of the area's history and the sites are above and beyond expectations! There is much to see and do on or off road in and around the Golden Gate bridge. For a bike ride unmatched, make your reservations and get your eTickets to experience the California Sunset Tour! 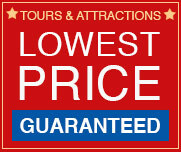 This tour operating year round. Tour departures currently at 4:00pm. (March to October). Departs at 3:00pm (November-February) Please arrive no later than 15 minutes prior to tour departure time for bike fitting and registration. No age limits: Child Ticket: Ages 5 to 11 years old. Toddler Ticket: 4 years old and under. 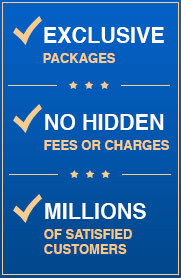 + Reservations are required 48 hours in advance of desired tour date. + Rentals are weather-sensitive. Under weather conditions that are deemed non-operable, they reserve the right to cancel any scheduled tour within 24 hours of the actual tour and will notify you at that time. Full rain cancels tour unless client wishes to conduct tour regardless of weather + Adult Riders must be in good health and able to ride a bicycle + Helmets are included and required for riders under the age of 18. Riders 18+ have the option to use a helmet provided with rental. Feel free to bring your own if you'd like.